Since the early 1830s, when the first pioneers arrived in the southern part of Wisconsin between -what is now- Milwaukee and the capital at Madison, the native Winnebago or Ho Chunk residents told of a “sunken village of rock tepees” under the Rock Lake. Their tradition was dismissed as mere Indian fable until two duck hunters peered over the side of their boat during a water-clarifying drought at the turn of the 20th century. They beheld a huge pyramidal building sitting dark and massively in the depths of Rock Lake. Since then, declining sub-surface visibility, abetted by pollution, has veiled the sunken structure in controversy. 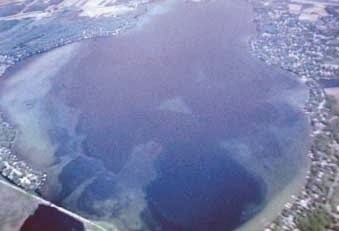 On April 11, 1936, Dr. Fayette Morgan, a town dentist and early civilian pilot in Wisconsin, was the first person to see Rock Lake from the vantage-point of altitude. From the open cockpit of his spindly bi-plane circling at 500 feet, he spied the black forms of two rectangular buildings on the bottom of the lake near its center. He executed several passes, and saw clearly their uniform dimensions and prodigious size, which he estimated at more than 100 feet each. Landing to refuel, Dr. Morgan dashed home for his camera, then took off at once to capture the sunken objects on film. By the time he returned over the lake, its underwater monuments had vanished in the late afternoon light. Subsequent and repeated flights to photograph or even rediscover them from the air failed until 1940, when a local pilot, Armand Vandre, and his rear cockpit observer, Elmer Wollin, spotted them again. But as their single engine airplane banked over the south end of the lake at less than a thousand feet, they were awestruck by an entirely new sight. Below them, under less than twenty feet of water, lay a titanic, perfectly centered triangular formation pointing due north. A pair of black circles was side-by-side near its apex. Beneath the surface of Rock Lake lie at least ten structures. Two of these have been mapped and photographed by skin divers and sonar. Structure no.1, which has been dubbed the Limnatis Pyramid, has a base width of 60 feet, a length of about 100 feet, and a height of 18 feet, although only about 10 feet protrude from the silt and mud. It is a truncated pyramid, built largely out of round, black stones. On the truncated top, the stones are squarish. The remains of a plaster coating can be discerned. Vandre and Wollin estimated the length of each side of the delta’s equal sides at 300 feet. Northeast of the triangle was the configuration of a small, narrow sunken island, perhaps 1,500 feet long and 400 feet across. More surprising was a straight line that led from the southeastern shore under water toward the apex of the sunken delta. When Frank Joseph discussed the sighting with Lloyd Hornbostel, a local geologist, he suggested the line was the remains of an extensive stone canal that connected Rock Lake with Aztalan, three miles away. Aztalan is today a 21-acre archaeological park featuring a stockaded wall partially enclosing two earthen temple mounds known as the Pyramids of the Sun and Moon. During its florescence in the late 13th century, the ceremonial center was twice as large. Then it comprised three concentric walls abutted with watch-towers surrounding a trio of pyramidal earthworks surmounted by wooden shrines. In its final stage, beginning around 1100 A.D., Aztalan belonged to the Upper Mississippian Culture that flourished throughout the American Midwest, into the South, although carbondating tests revealed its earliest known origins in the 3rd century B.C. Its population maxed out at an estimated 20,000 residents, who lived on both sides of the walls. They were led by astronomer-priests, who precisely oriented their pyramids for the computation of numerous celestial phenomena, including the winter solstice, phases of the moon, and positions of Venus. Around A.D. 1320, the Aztalaners inexplicably set fire to their city, abandoning its flame-engulfed walls. According to surviving Winnebago oral tradition, they fled far to the south. Interestingly, their migration coincided with the sudden rise of the Aztec state in the Valley of Mexico. "The discovery of underwater structures there may foreshadow a far greater one to come, when we at last turn our investigation into the sea, and probe its depths for the lost fountainhead of earthly civilization—Atlantis. Rock Lake is notable for the sunken stone structures it contains—pyramidal burial mounds of men who worked the copper mines of Michigan’s Upper Peninsula from 3000 B.C. to 1200 B.C. The mines were probably excavated and operated by engineers from Atlantis, so at least some of the underwater tombs contain the remains of Atlantean workers", said Frank Joseph.